Oct. 13, 2017 3:00 p.m. 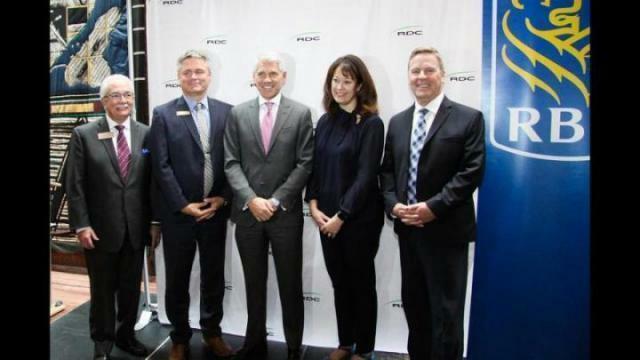 The Royal Bank of Canada (RBC) recently announced a $450,000 investment in Red Deer College (RDC) that will be directed towards many initiatives including mental health and the College’s Shaping Our Future Campaign. According to Ward, the Shaping our Future campaign is about the future of RDC and its ongoing journey to becoming a degree-granting polytechnical institute. The campaign also includes capital projects like the Gary W. Harris Canada Games Centre and the College’s new alternative energy lab. “Our future is all about the ability to offer degrees, to expand our student population and the ability to serve those learners who don’t have the opportunity today,” Ward said. Ward was grateful for RBC’s support for campus issues like mental health. Ward explained that the $450,000 investment over four years will go towards career development; supporting mental health and well being; the ability to hire more student ambassadors; the extension of campus services hours of operation; and the ability to provide students access to a 24/7 online health and wellness support network. RDC Business Administration Student and Student Ambassador Charity Lehn has seen the positive effects of the student ambassador program. Lehn was pleased more student services will be available to access through the RBC investment.